Hi friends! I hope you're having a lovely day. I'm having a bit of a bad day as far as not feeling well. Hopefully, tomorrow will be a better day. 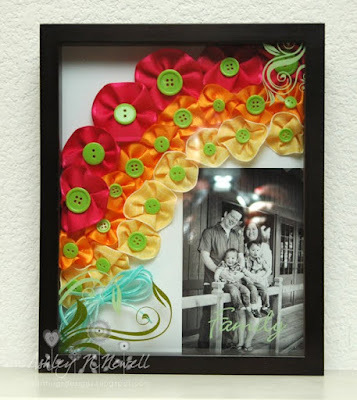 Here's a project I made for the May Arts Candy Colored Challenge. I always love working with May Arts ribbon and this time was no exception. Please pop over to the post and VOTE FOR ME! :D Everyone who votes is entered in a drawing to win a full spool of all the ribbons that the entrants got to work with. Even if you don't want to vote for me, you should STILL cast a vote for the chance to WIN! Have a great day, everyone! Have a happy tomorrow!